Besides these, Aden came under Bombay Postal Circle and Malaysia/Singapore came under Calcutta Circle. I am sending by special courier to Bhutan a small parcel of the Lama’s native-made stamps. The Grand Lama, himself, is sponsor for this set, which is inscribed in the Bong or headless language. We employ two languages but the Bong is the talk of the physicians or priests. The religious fervour of the Tibetans is unequalled by any nation on earth. Everywhere there are monasteries. Black-robed priests form nine-tenth of the village population. The robes are worn as a Roman toga. The head priest also wears a head-piece not unlike a gladiator. The Chumbi valley is bitter cold in its cloak of ice and snow nine months of the year. Tibet is about two miles above sea level, hemmed in by wall-like mountains on four sides. The only entrances are where rivers tear their way through to the sea. This is the land of Mount Everest, the highest peak in the world. This was at a time when China, our mother country, was in a weak position and the Russian bear was putting out a threatening paw. The British lion, jealous of a possible loss of a good market for India, sent an army into our land and now each year we pay a fine of 7 ½ million rupees because we attacked the English army, when they looted our shops and temples. You want me to write about the stamps. I don’t know much about the stamps. The white lion is our sacred emblem of life and death. We refer to it as the “White lion of the mountains,” where it lives among the eternal snows. 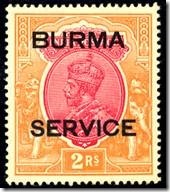 Anyone can buy the stamps, but the only purchasers are the soldiers of the English, and they use the stamps not on letters, because soldiers do not need stamps. They send stamps to home towns. As more traders come in, the more use for stamps and soon we have stamps the same as used in India. A curious symbol, depicting 74 was commonly seen on North Indian letters in the old. The story of the same was given by a recently deceased philatelist(he passed away after suffering with a lung disease for seven years) whose demise became public only yesterday. The person was well adored and respected over his knowledge over Indian Postage.